Cross-laminated timber's reputation and use in local construction projects won't suffer the same fate as other building materials that have failed in the past and, in fact, should continue to improve as more is learned about how to incorporate it successfully, according to a pair of Portland attorneys. CLT is made by stacking layers of timber planks at 90 degrees to each other, using adhesives to glue everything together and then pressing the layers to form a solid panel. 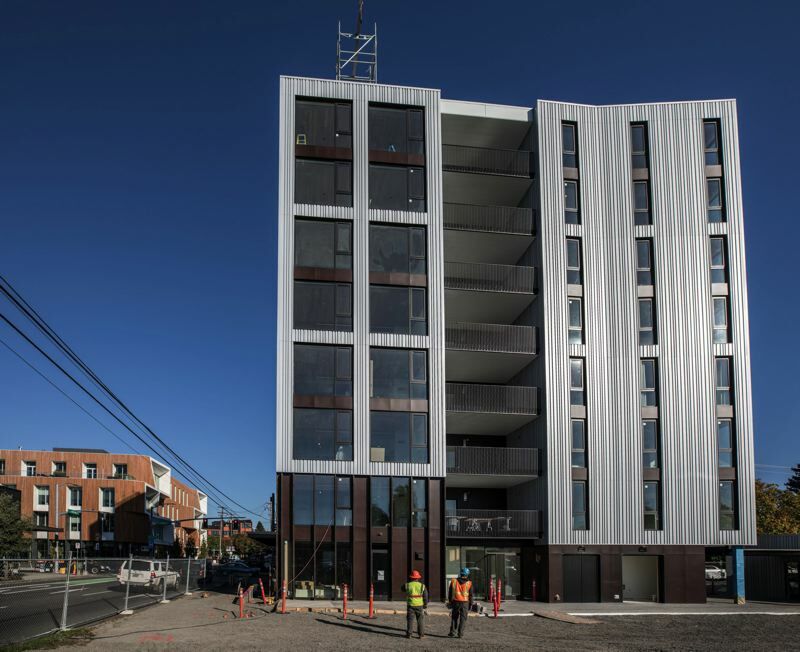 It has been highlighted in projects such as Carbon 12, an eight-story mixed-use building on Northeast Fremont St., and North Portland's Albina Yard. Praised as an environmentally friendly, renewable product, CLT also can be less expensive than steel or concrete, depending on material availability and cost. It is lighter and more flexible and may be able to withstand seismic stresses as well or better than other materials. In some cases, it can help accelerate construction time. CLT also has been credited with creating jobs and providing an economic boost to the state's forestry industry. Because its use is relatively new in the United States, however, CLT also can pose certain risks. Its organic makeup means it could be subject to damage from water, mold and other elements that can impact its structural integrity. "And, because it is a new product here, design professionals have not fully figured out the best applications, and therefore it is susceptible to being used in inappropriate projects," said Jeremy T. Vermilyea, who runs Vermilyea Law offices in Portland, Vancouver and Seattle. The recent failure of faulty CLT panels in the Peavy Hall project at Oregon State University and the decision to shelve the 12-story CLT tower called Framework in Portland, highlight some of the concerns about its use as a building product. Despite the potential risks, Vermilyea said, CLT should continue to gain proponents because of its strengths. "I do think it has a chance to become a significant building component, along with steel, concrete and others, as people get more comfortable with using wood in high-rise and more commercial and industrial settings," he said. "Europeans have been using CLT as a building product for many years now and it's proven to be durable, reliable and safe when designed and constructed correctly." Vermilyea noted that CLT, and any other component of a construction project, has to be subject to quality controls, and there are bound to be a few hiccups as designers, manufacturers and builders learn the uses and limitations of the product, and how to ensure in the manufacturing and design process that the products hitting the marketplace are of the safest and highest quality. "It would not surprise me at all if, at some point in the near future, an industry association is formed (if one has not already been) that develops and publishes manufacturing standards, design guidelines, etc. These are the signs of a maturing marketplace and I do think CLT will get there," he said. Marcus Eyth, a partner with Davis Wright Tremaine, has an architect/developer contact who successfully built a project with CLT and is a big proponent. While CLT has caught the interest of many designers, developers and contractors in Oregon, where innovation, sustainability and environmentally friendly building continues to be a focal point, Eyth said he believes the jury is still out on whether CLT will truly take off in the industry. "I would give it a few more years to see whether it develops into a common option chosen off of a menu compared to the more traditional options," he said. At the same time, Eyth said, it's unlikely that CLT's reputation will be irreparably harmed by recent setbacks, which appear to be isolated incidents and do not indicate that CLT is generally defective. Both Eyth and Vermilyea have worked on construction defect cases in the past and were able to make some stark comparisons. Eyth has litigated defective concrete, siding, roofing material and similar construction cases, most of which also involved defective installation of the materials. "Those types of construction defect cases are pretty common and simply result in remedial work, and sometimes give the 'culprit' contractor or subcontractor a bad reputation," he said. Vermilyea worked on several construction defect cases in the early 2000s that involved synthetic stucco, also known as exterior insulation finish systems (EIFS). The first generation of EIFS had problems because the product was originally designed for use on the exterior of concrete buildings. Drainage was not a critical consideration because concrete doesn't rot the way wood can. When the panels began to be used on wood-frame buildings, water would get trapped behind the panels and could not escape, which led to rot, mold and a whole generation of problem buildings, all because the initial systems were not designed to drain water, he explained. In addition, there were problems with manufacturing, product design and installation fed by lack of education about the complexity of the product, and problems with the selection of appropriate projects to install the product on. Eventually, the product was redesigned with drainage, design professionals and contractors became better educated, the insurance industry began imposing limits on what they would insure, and the marketplace eventually adjusted, Vermilyea said. "I don't see CLT in the same way as EIFS. Partly because people have learned the lessons from EIFS, and partly because the nature of the product is different, and not as complex," he said. "It may not take over the industry the way some people are predicting, but from what I have seen it is a viable structural component that will earn a place among the other major players."